Joseph Tang, co-founder of the Composers’ Consortium, and Aileen Markovitz, co-founder of the Classical Music Club. It started two years ago with a handful of Notre Dame undergraduates and a desire to share their love of music. Today, that passion has resulted in two thriving student groups — the Classical Music Club and the Composers’ Consortium — with more than 200 members. The club, which began with just five members, has now grown to 200 participating students and six officers from across the University. Markovitz and Kim serve as co-presidents. Its aim, Markovitz said, is to give students more opportunities to experience and appreciate classical music. One of the most important aspects of the club, Markovitz said, is that it has members — and even officers — from a wide variety of majors, from finance to neuroscience. 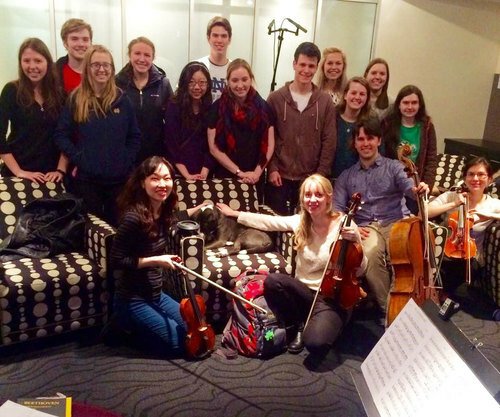 Members of the Classical Music Club gather after an event with the Grammy Award-nominated Solera Quartet. 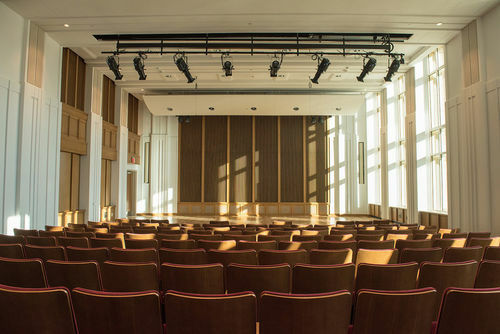 In addition to organizing groups to attend events on campus, the group meets twice a month to listen to and discuss classical music and hear from guest lecturers and performers. The club also arranges for interested members to perform three concerts each semester at local nursing homes, an effort organized by Kim. Markovitz also plans to organize club trips to Chicago in the future and hopes to establish a program to provide music lessons to underprivileged children in South Bend. 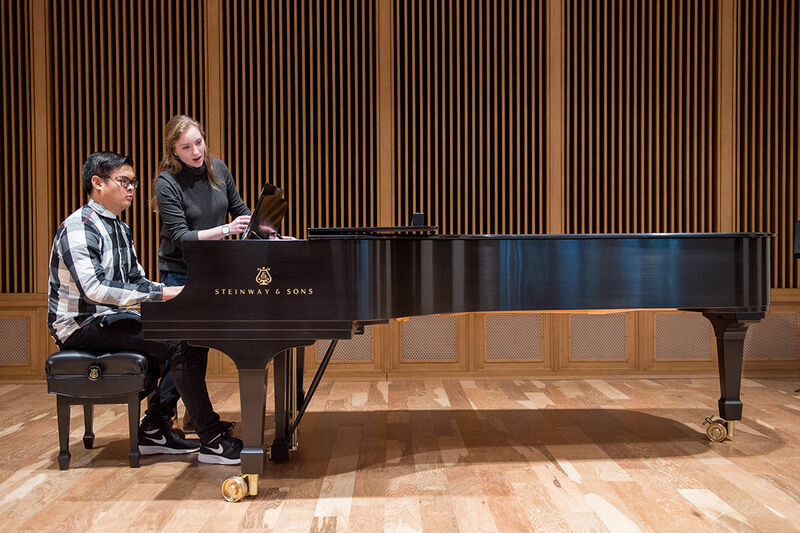 Alex Mansour and Tang co-founded the Composers’ Consortium, which presents concerts every semester featuring original works by Notre Dame students. 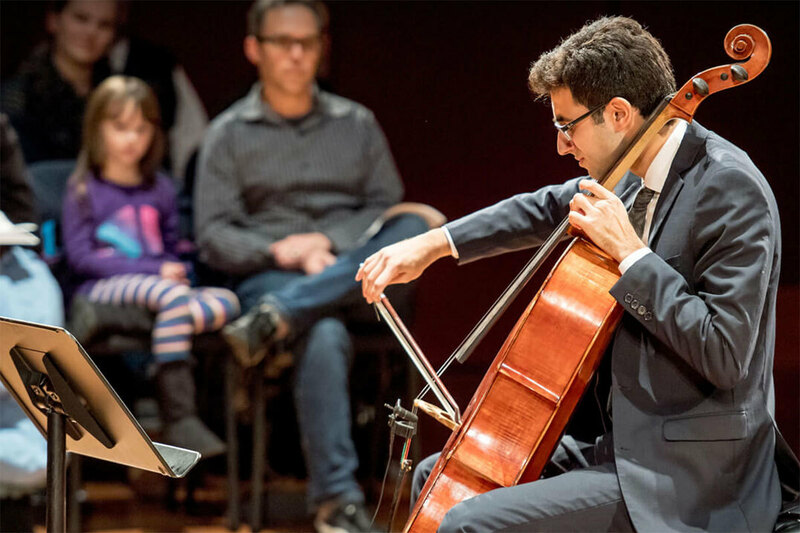 At the same time Markovitz and Kim were launching their club, music majors Joseph Tang and Alex Mansour were approaching Assistant Professor John Liberatore with the idea of putting on a concert featuring original, classical works written by students. Liberatore, now the faculty adviser for both clubs, enthusiastically supported the idea, and the Composers’ Consortium presented its first concert in spring 2016. Since then, the consortium has been meeting twice a month and offers one concert every semester. The Composers’ Consortium held its spring concert April 6 in the LaBar Family Performance Hall inside O’Neill Hall, the Department of Music’s new home. At their meetings, students present their progress on various pieces to the group and receive valuable feedback from their fellow composers. The consortium also benefits the department as a whole, Liberatore said. “When you have a healthy contingent of student composers, it elevates the whole music program,” Liberatore said. “Because when students are writing their own pieces, they’re recruiting performers, building connections with one another, and learning how to interact with other professionals — and it tightens the whole community. It also teaches students how to organize concerts and promote their own work. “When you have a healthy contingent of student composers, it elevates the whole music program. Because when students are writing their own pieces, they’re recruiting performers, building connections with one another, and learning how to interact with other professionals." Originally published by Carrie Gates at al.nd.edu on April 11, 2018.